My husband and I have been dog sitting for my daughter and her husband while they were out of town, and it is oh so good to be back home. While I love dog sitting for Reilly, and I truly enjoy living in the lap of luxury – my daughter and her husband have a beautiful home – there is no place like home. Actually, I did spend a couple of nights home while my husband traveled back and forth, as my knee got reinjured in my land based evaluation. I’ve been participating in aqua therapy for the past 3 months, and have made excellent progress. It was trashed in a few short minutes. My regular therapist was out sick, and the person who was covering for him, put me on a machine and left me there for 20 minutes. I finally asked another therapist to help me off the machine. Unfortunately, my kneecap shifted out of place, then moved back where it’s supposed to be. And let me tell you, that is not a pleasant feeling at all. To say I’m disgusted is putting it mildly. The swelling started the next day, so back to the familar RICE routine – Rest, Ice, Compression and Elevation . I am sick to death of that routine. Tomorrow is my last aqua therapy session – my health care insurance won’t pay for anymore, and I will ask my aqua therapist what she thinks of the mess. She’s terrific, and will hopefully have some good advice for me. I finished reading a book, started another, and am making very good progress with my handknit lace sweater. 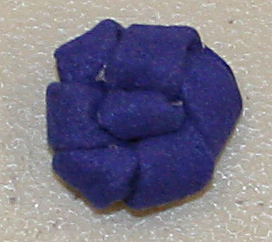 We had a very nice meeting this month, with beautiful show and tell, and a bead making session. Unfortunately, my camera acted up and I lost some of my photographs. Most were of Pat’s beautiful African photo quilt. Her husband is a terrific photographer, and they printed some of his images onto fabric. 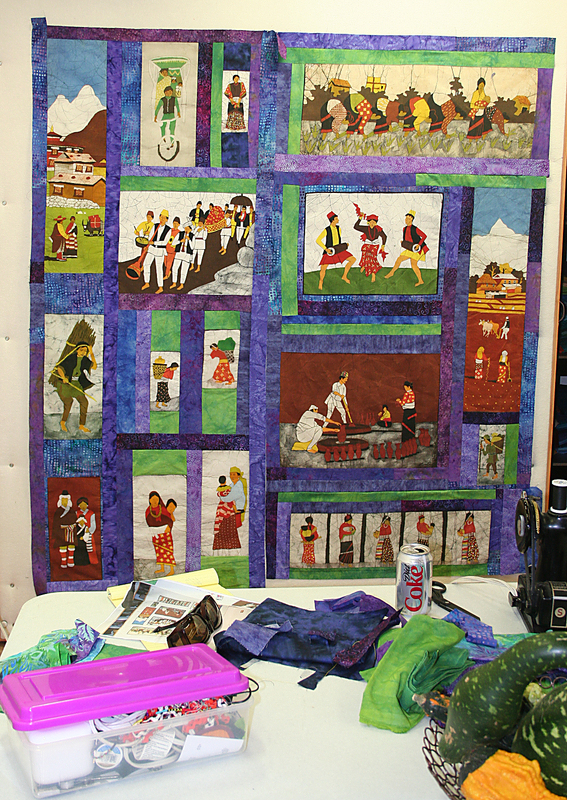 The quilt was spectacular, and Pat added a section of finger weaving that suited the piece perfectly. She’ll be teaching us how to finger weave next month. 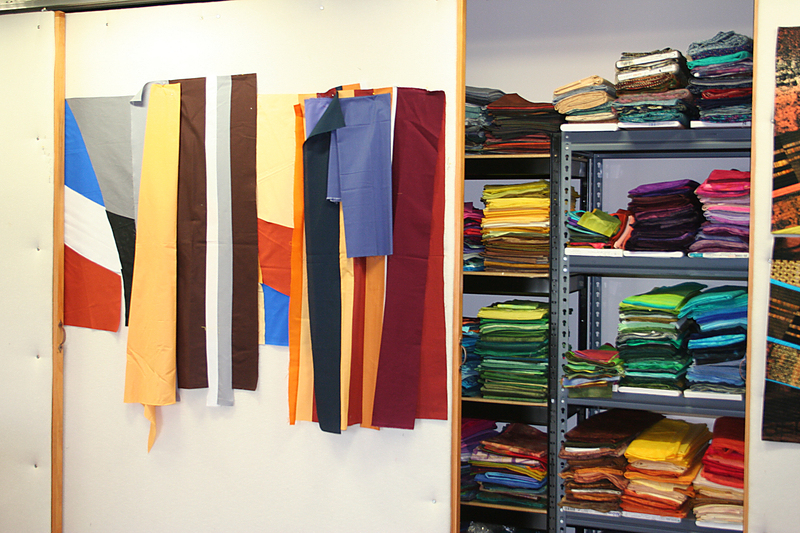 Various fabrics were used such as fleece, ultrasuede and cotton. All of them looked darn good, don’t you think? Tuesday was a beautiful, sunny day in Upstate New York, and it was a great day from the beginning to the end. My morning started off with my friend Beth picking me up to drive with her to Marcia DeCamp’s art studio. 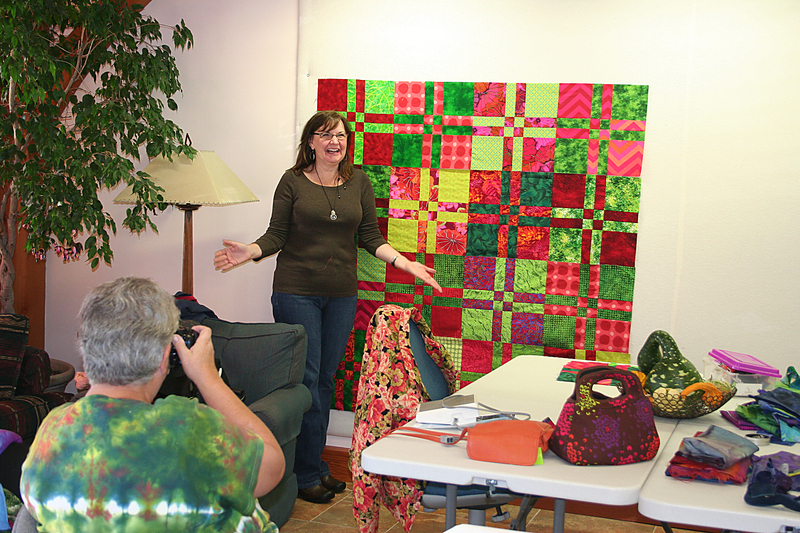 I met Marcia a few years ago when she joined Genesee Valley Quilt Club, and we are also members of Rochester Area Fiber Artists. That’s just a small portion of some of her fabric collection. It’s a good mix of commercially printed fabric and her own hand dyed fabrics. If you double click on the photo, you might be able to make out the tracks along the top of the photo. That’s how the walls slide back and forth. There are also quite a few tables in her studio, and she is a gracious hostess,who welcomes her fellow textile artists to her wonderful studio for work sessions. Her cutting table is the perfect height and LARGE, and she also has a long arm quilting machine. You might have seen some of her pieces in various shows across the country, and I count myself very lucky to have been able to visit Marcia in her studio this week. 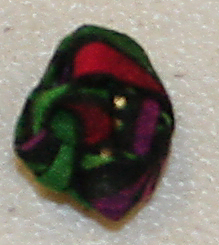 Marcia was working on a portion of a wall hanging, but I didn’t take photos as I think it will most likely be headed for some national venue, and a lot of the shows/galleries do not like pictures of quilts being displayed on the internet before they are accepted. The colors were wonderful earth tones, my favorite color palette. I was making fabric beads and trying to sketch a layout for a quilt that has lingered on my design table for a couple of years. Inspiration didn’t strike, so it most likely will linger a bit longer. It was a wonderful day filled with lots of laughter, one of Beth’s cherry pies, and good conversation. Thank-you Beth for driving, and thank-you Marcia for opening your studio for us. The yarn is actually a mix of very pretty pastels, but the lighting was bad when I took the photo. Lightly butter your baking dish. I cook for two, and didn’t want to be eating this all week long, so my pan size was 8 x 8 inches. This recipe can easily be doubled. Cook and drain your pasta. 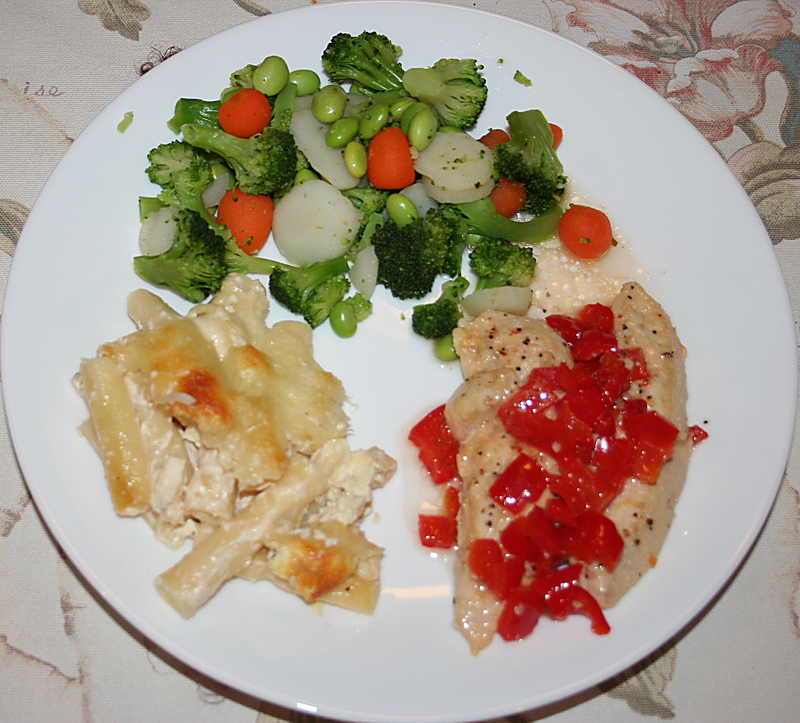 Reuse the pan you cooked the pasta in – who wants to wash a lot of dishes – and add the Alfredo sauce. Make sure the pan is off the heat, and gently stir the sauce through the pasta. Place half this mixture in your greased pan. Mix well, and evenly distribute over the pasta you have in your pan. Spread the rest of the pasta over the ricotta layer. Sprinkle 6 ounces of grated Mozzarella cheese over the top. Bake at 350 degrees – uncovered – for 30 minutes or until it’s nicely browned and bubbly. 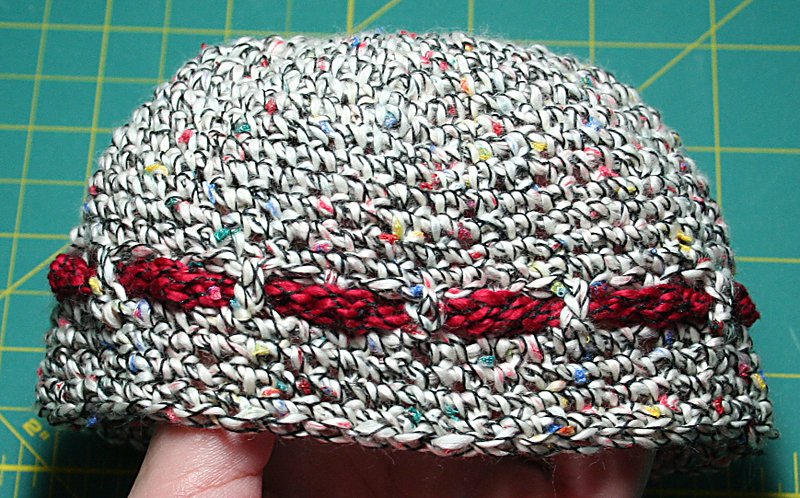 On the textile front, I’m almost finished with the knit preemie hat, and tomorrow I’m making fabric beads, and visiting a friend’s art studio. It took very little time and is made out of another soft Conshohocken yarn I had in my yarn collection. These are so darn small. My daughter was 9 pounds at birth, and came home from the hospital in 6 month size clothes, so I have no personal experience holding a small baby. 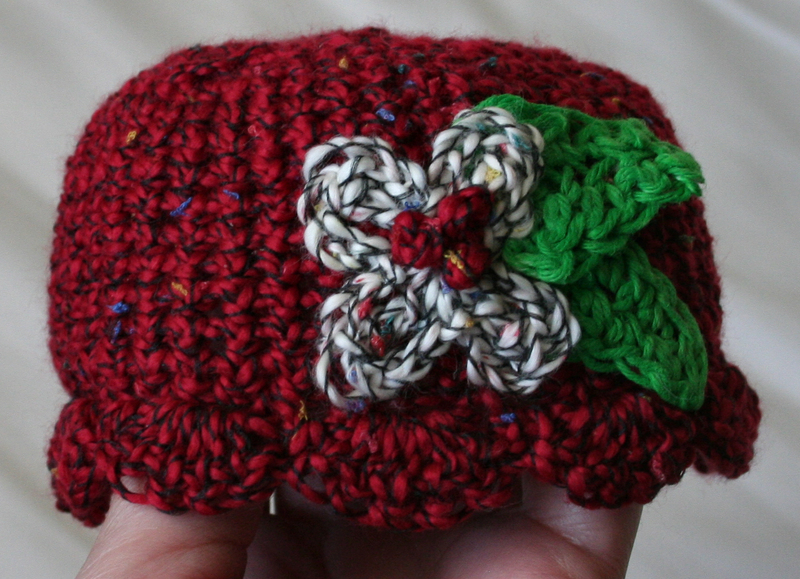 From the pictures I’ve seen, these hats might actually be too large for the very small preemies though. Next, I’ll try a hand knitting pattern. It was another free pattern from www.youcanmakethis.com It will most likely take me a few days as it is knit with 4 double pointed needles. It’s been a long time since I’ve knit anything tubular. My hands will have to relearn how to hold the needles. There is always that adjustment period where I poke my hands, or my stomach, then lose a needle here or there before I get into the 4 double point needle knitting rhythm. This is a recipe from an old Polly-O Ricotta cookbook. The page was torn out and in a pile of recipes I’ve kept for about 30 years. 1 tsp grated lemon peel – I didn’t have any in the house so substituted 1/2 tsp lemon extract. 3/4 cup chopped pecans – Next time I make this I’m going to use slivered almonds. Preheat oven to 350F. 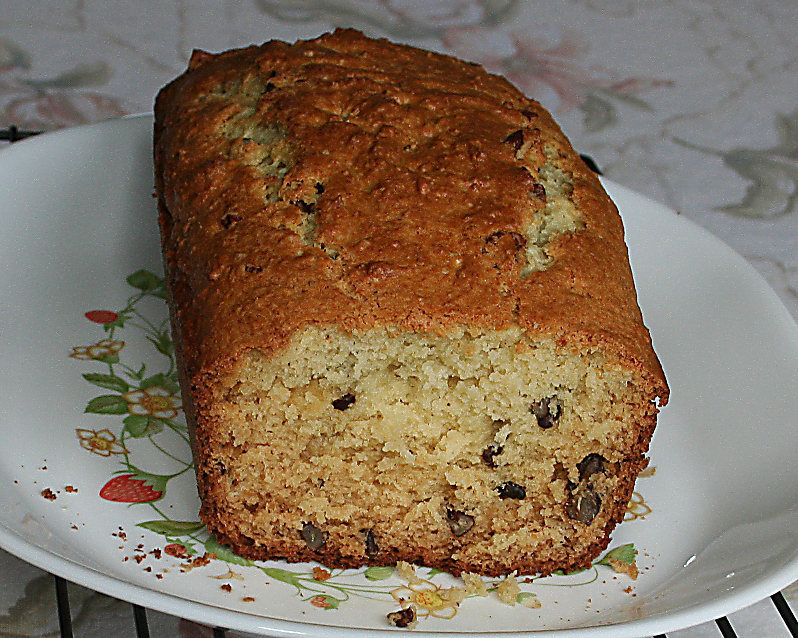 Grease a 9×5″ loaf pan. In large bowl, combine the 5 dry ingredients. In medium bowl, beat together the butter and remaining ingredients, except for the pecans. Add the dry ingredients and the pecans, stirring just until blended. Scoop into pan; smooth top. Bake 50-60 minutes until toothpick inserted in the middle comes out clean. I’ve been on a quest to locate Polly-O Ricotta Cheese since my 2 local grocery stores stopped carrying it. They said it was too expensive, and nobody would buy it, but I live in an area with a high percentage of Italian-Americans and we like our Polly-O. I wouldn’t bother making my Mom’s lasagna recipe without it. Wegmans is now selling their own store brand, and so is Tops. I tried them both, and they don’t remotely taste like Polly-O. I want my Polly-O Ricotta Cheese. For those of you who don’t live on the East Coast, I found that it can be mail ordered from www.netgrocer.com Yippee!!! I’m sure some of the small Italian import stores still carry it, so all was not lost for me. I was talking about buying some in aqua therapy (I chat with everyone while we’re exercising.) 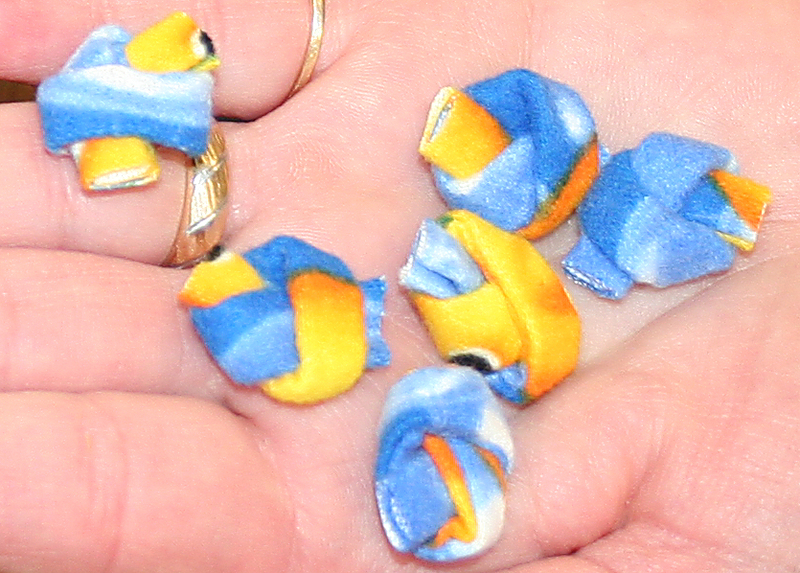 and had the good luck to be in the pool with a wonderful lady who told me she makes her own. She is a cook at the Italian-American club. Who better to know what is what with Italian cuisine? Buy 1 gallon of whole milk and heat it in a double boiler till it is 190 degrees. Stir while heating to make sure you don’t scorch the milk. Stir in 1/2 cup of distilled white vinegar and 1/2 to 1 tsp of salt. Stir it, and it instantly separates. Cover the pan and let it sit for a couple of hours. Line a colander with muslin – I used 2 layers – and pour out the mixture. Let it drain for an hour or two – depending on how condensed you like your ricotta. I let mine drain for an hour. Voila, you have ricotta cheese. Store in the fridge in a covered container, and it will keep for about a week. My yield was about 1.5 pounds of ricotta cheese. I’m also going to experiment with adding different seasonings. I have a little under 2 ounces of liquid hickory smoke in the house (left over from making 7 pounds of venison jerky) and am wondering what smoked ricotta cheese would taste like??? And I’d like to try adding some dried basil from my garden for an herb infused ricotta cheese next. This is not hard, and while it does take some time, most of it is spent in waiting for it to cool, and then drain. I can’t wait to infuse different ingredients during the cheese making process, and will be sure to share my favorites with you. No pictures this time, but I’ll most likely take some when I make it again so all of you can see how each step should look. Sad to admit, but true, I have been totally absorbed by playing Farmville on Facebook. It has sapped all the creativity from me. No more. In my defense, I’ve been recovering from knee injury after knee injury, ankle sprain after ankle sprain, and have not been very mobile for a long time. Aqua therapy is paying off, and I’m getting stronger. I can walk some, do a bit of weeding, and am slowly but surely rehabbing my atrophied muscles. 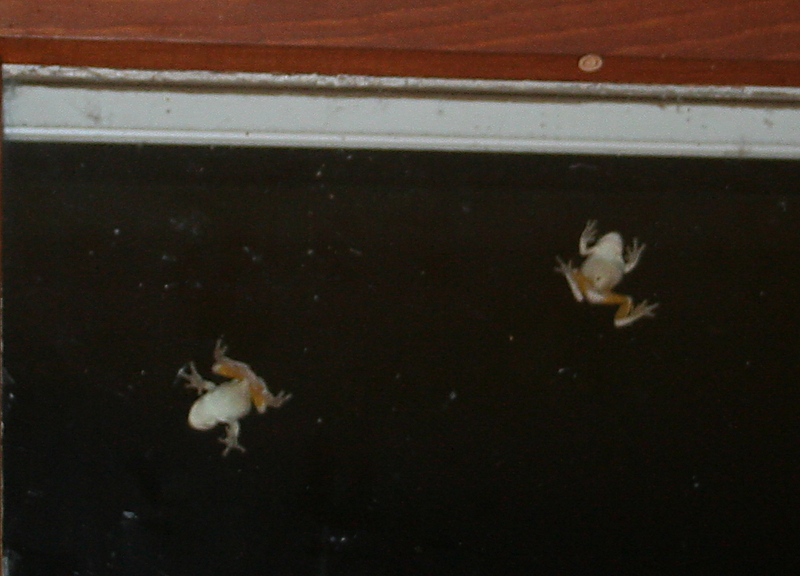 Yes, these little frogs climb our living room windows every night to catch their supper. As night falls, and our lights are turned on, all sorts of moths and flies are attracted to our windows. It’s like bringing take-out meals to the little frogs. These are not short windows. They are at the top of them and about 10 feet from the ground. One evening one of the smaller frogs snagged a moth that was bigger than he was. We couldn’t believe it. My husband and I were afraid it was more than he could handle. His rear leg fell off the window, and it was touch and go for awhile, but he hung in there ,and won his hard fought battle. Watching the ecosystem at work helped pass the time. 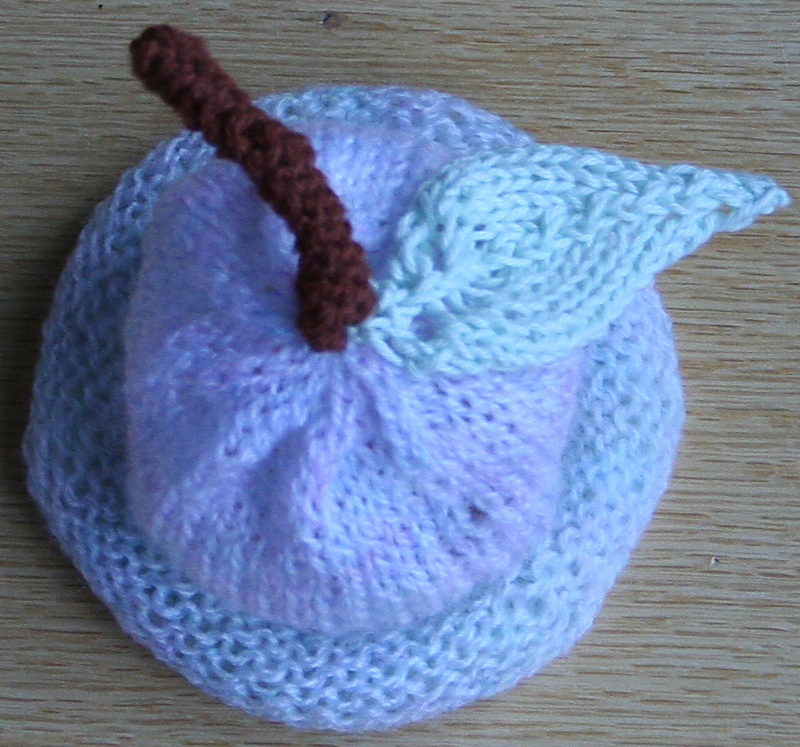 That is an adorable preemie hat I made from a free pattern at www.youcanmakethis.com The softest of cottons – Conshohocken cotton – was used for the hat and the flower trim, and the leaves were made with Cottontale 8 yarn. It was a very light shade of green and I wanted it leaf green, so mixed some paints together to get the color I wanted. The simple act of mixing paint colors now has me interested in overdying a silk scarf I made a few months ago. Isn’t it interesting to see how starting out with a simple little project, got my creativity jump started?